The night before an international ping pong tournament, Carl Grant won an informal ping pong match with a man wearing the jacket of the Chinese team. This was a big deal – they were, and still are, the best ping pong team in the world. The next day, while talking with one of the other Chinese players, he casually mentioned that he had won a match with one of their players. "Which one?" the Chinese player asked. Grant pointed. "Oh yes," the Chinese player said. "That's Mr. Chen. He's our cook". That was more than thirty years ago. Today, Carl Grant is a professional speaker, comedian, and also both the advisor and coach for SCC’s Ping Pong Club. Grant came to SCC about seven years ago and started coaching the Ping Pong Club three years later. It was Movakel Sargizi, SCC's former recreation coordinator who suggested Grant take over the club. According to Grant, the club has changed a lot since he started. Currently, the club has 14 members, but when the club was at its peak, the membership was almost triple that. Grant said the club’s new meeting room was a large factor in this. “We were up in the gym then and it was much more visible.” Grant said. Now, the ping pong club meets in a room hidden on the bottom floor of the Gymnasium, under the main entrance. 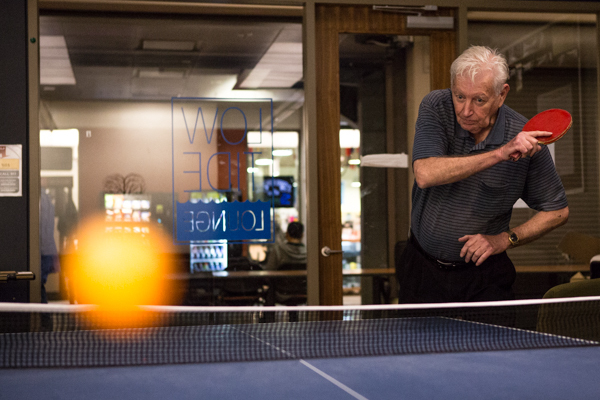 Grant, who initially came to SCC to teach a continuing education class, first started playing ping pong in college, while representing Western Washington University at a pool tournament at the University of Washington. There, he met Joe Lee, who was representing the University of Washington at a regional ping pong tournament. From Lee, Grant got a paddle, and started playing regularly. At SCC he found himself taking advantage of the ping pong table in the the old PUB. There, he befriended Yiyong Fan, a former SCC student and one of the top ping pong players in the United States. Away from the table, Grant is a professional speaker and comedian with extensive teaching and coaching experience. He has appeared on networks like BBC II, Showtime and, for him, one of the most memorable of all ― "Late Night With David Letterman". “I got on Letterman because a friend of mine,” Grant said. His friend, who he had played pool with, had gone on to be a comedian and was friends with Letterman. “What ended up happening was (my friend) saw me do something that was televised locally,” Grant said. His friend was impressed, and gave Letterman one of Grant’s tapes which eventually got him onto the famous late-night show. Grant has been doing comedy almost all his life, just like ping pong. Grant said he recommends ping pong as a lifelong sport. Unlike other sports, ping pong doesn’t put too much pressure on vital body parts, which prevents injuries for people of all ages. Furthermore, he said people could get a better workout because the game is fast-paced and there isn’t much downtime. But most of all, he said, ping pong is fun. Grant said that he would like to make the club big once again. With more members, the club could get a larger budget and a new table, so people could always find a place to play.